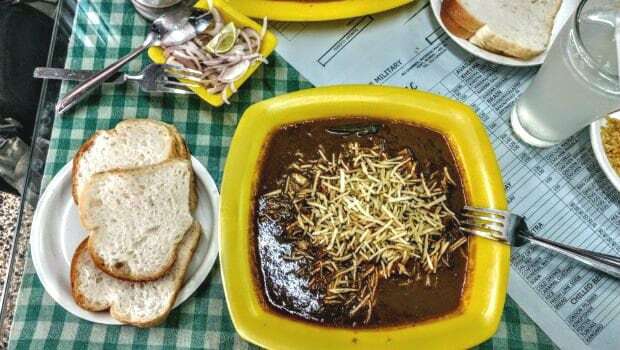 Pretty much everyone knows about Mumbai’s iconic Irani cafés: how their owners came to Mumbai from Iran, lured by the promise of financial growth; how they took over the corner locations that were considered inauspicious by local businessmen; how they have a lengthy list of dos and don’ts chalked onto boards (Do not comb hair at the table, do not place feet on chairs, etc) that were lovingly satirised in Nissim Ezekiel’s wonderful poem Irani Restaurant Instructions; the ubiquitous chai and bun maska on the menu; the old-world décor; and sadly, how, in spite of a spate of documentaries and articles about them, they are still dwindling. The Irani café was born in Mumbai at a particularly opportune time. In Frank F Conlon’s essay, Dining Out in Bombay, available in the anthology Consuming Modernity: Public Culture in a South Asian World, edited by Carol Appadurai Breckenridge, we learn that Mumbai was in a state of flux at the end of the 19th century and the start of the 20th. “Bombay city was recovering from the socio-economic dislocations brought on by the plague outbreaks of 1896 and subsequent years,” writes Conlon. “Economic activity and population both were increasing…Furthermore, the Bombay Improvement Trust’s urban renewal activities were cutting new roads through the congested parts of the city, creating new commercial frontages where Irani shopkeepers could find profitable opportunities”. The cafés became harbingers of social change, bringing together people of all religions, classes and denominations who congregated there for a cup of tea. Muslim-owned cafés were born in areas where Muslims congregated, and Zoroastrian-owned cafés came up where Hindus and Parsis tended to dominate, but both advertised that people of all religions were welcome, in other words, a ‘cosmopolitan’ environment. This was likely the origin of the name of Cosmopolitan Restaurant and Stores, an Irani café in Khetwadi run by (a woman! Surprise!) Mrs. Freny Irani. Irani cafés helped to alter the social scene in other ways too. Their Family Rooms were designed to draw in women from genteel families; they could dine there discreetly, hidden behind wooden or opaque glass screens (the sign hangs still at some Irani cafes) or on upper levels. A rare thing for the time, since respectable ladies were not encouraged to dine in public. At Regal Restaurant in Byculla, a grandiose sign announces ‘Special Accommodation for families at Upstairs’ at the foot of a rickety flight of steps. But it is only at B Merwan that we find that the rule still largely applies – ladies, families, children are often gently ushered into its ‘Special Room for Ladies and Family’. Often, the food at the Irani café was calibrated to please not just the local population of Muslims, Christians, Parsis and Hindus, but also the British. Cafe Military, on Medows Street, still has a menu from 1935 that offers dishes such as Boiled Tongue, Mutton Roast, and Cold Liver and Salad (“Bread and Butter, extra charges”). The name itself harks back to a time when Fort was home to a strong military presence; Cafe Military was just one amongst a sea of refreshment rooms, hotels, clothiers, etc that subsequently sprang up in the locality, to cater to the military. Any talk of the Irani café in Mumbai is always bound to be stained by elegy. So many have closed down; a scant 25 or so remain today. Among the ones lost to us are Bastani, which used to sit opposite the famous Kyani & Co, and was the one that inaugurated the lengthy list of instructions that have now become synonymous with the cafés. (To reflect modern times, Kyani’s has updated its list of Don’ts to include strict prohibition of the use of laptops). Happily, others are joggling on. Some have re-calibrated themselves to appeal to a younger, broader demographic – places like Cafe Leopold that have become fixtures on tourist guides. Some, like Cafe Mocambo, have held on to some of their old world charm, but added air conditioning, fresh furnishing, and refurbished the menu to include dishes such as Kung Pao Paneer and Chinese Fries. On the other hand, Ideal Corner, on Gunbow Street, holds on to its Parsi menu with superb daily specials (although it has integrated a scant Chinese section on to its menu). Cafe Military still has the bentwood chairs, mirrors and merry checked tablecloths so typical of an Irani cafe, but its menu has shifted to exclude the old British favourites, and includes dishes such as kheema pao and akuri. The much-vaunted Britannia & Co – famous for its berry pulao, its warm yet eccentric proprietor Mr. Boman Kohinoor, and his love for the British royal family – doesn’t seem to have changed very much at all (except for its more recent inclusions of prawn and paneer berry pulao on its menu). Best of all, there is the cheering fact that a brand new Irani café has opened up in Mahim – Cafe Irani Chaii. Perhaps we can hold out some hope yet.